Audible Magic, one of the best known anti-piracy companies operating in the digital fingerprinting space, has filed a complaint against Google at the US Patent and Trademark Office. The California-based company says that YouTube's registration of the trademark 'Content ID' was made fraudulently and should be canceled. Automatic Content Recognition (ACR) technologies have been available to the public for a number of years. Perhaps the most visible is the mobile app Shazam, which allows users to identify the name of a song after listening to just a short clip. The same kind of technology is famously deployed at YouTube. Its (in)famous Content ID system can spot copyrighted content uploaded by users and make a decision whether to take it down or allow rightsholders to monetize it. 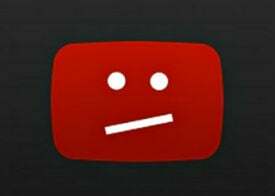 However, YouTube now faces a legal challenge over the Content ID trademark. Audible Magic has been operating in the content recognition and fingerprinting market for more than fifteen years. In fact, during 2006, YouTube and Audible Magic signed an agreement which gave YouTube a license to use the latter’s content recognition technology. Audible Magic’s system was called Content ID, a term YouTube also uses to this day. Its agreement with the content recognition company was terminated in 2009. It’s clear the Audible Magic feels it has a claim to the name and that is the basis of the complaint the company has just filed with the United States Trademark and Patent Office. Describing itself as “the leader in automated identification of audio and visual content for web media platforms,” Audible Magic says it has worked with the biggest names in media, including Warner Bros, Sony, Disney and Facebook. As highlighted above, between 2006 and 2009 it also worked with Google. In its complaint to USPTO, Audible Magic says that during 2006, YouTube was facing accusations that it was a “prime enabler” of copyright infringement and pirating. “The television and movie industries were complaining that YouTube was allowing third-parties to upload copyright materials from television and movies and was not instituting any controls or checks on third-party content. This negative publicity was particularly damaging to YouTube in 2006 when Google was considering acquiring YouTube for over one billion dollars,” the company writes. To address this problem, in October 2006 Audible Magic and Google signed an agreement for YouTube to license Audible Magic’s Content ID system. After YouTube had been bought by Google, the license was transferred to the search giant. The agreement between the companies was terminated three years later, at which point Audible Magic says that all intellectual property rights in Content ID reverted back to its control. 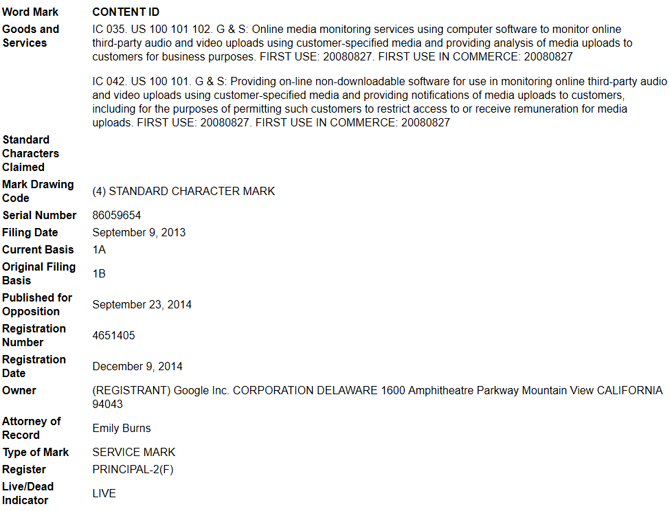 However, Google applied for a Content ID trademark in 2013 and the trademark was registered in 2014. “According to the date of first use claimed in Google’s registration, Google asserts that it first used the Content ID mark in connection with its services on August 27, 2008,” Audible Magic writes in its complaint. While Audible Magic feels it has a claim over the name, one of its biggest concerns surrounds the confusion that is set to arise with Google using the term ‘Content ID’ in a marketplace already occupied by Audible Magic. “Such confusion may cause harm to Audible Magic and the consuming public and jeopardize the valuable goodwill and reputation Audible Magic has built up in connection with Content ID and its services,” the company explains. In closing, Audible Magic asks the United States Patent and Trademark Office to cancel Google’s trademark registration on the basis the company “committed fraud” in 2013 when it signed a declaration which stated that it knew of no other company entitled to use the Content ID mark in commerce.